Photographer is Martin of Chicago, Illinois [“Opposite Marshall Fields”]. Otherwise undated and unidentified. I’m not quite sure what to make of this one. Thoughts and suggestions are welcome (as always). Does this woman actually have some association with a farm? Is a studio setting like this, taken in downtown Chicago during times of booming industrial growth, intended to convey romantic nostalgia for a rapidly vanishing way of life? Are we expected to believe that she would wear this dress to go feed the horses? Is that expression on her face a smirk showing us this is all one big joke? Matt, she is holding a wad of what looks like hair. From a sheep I would guess. 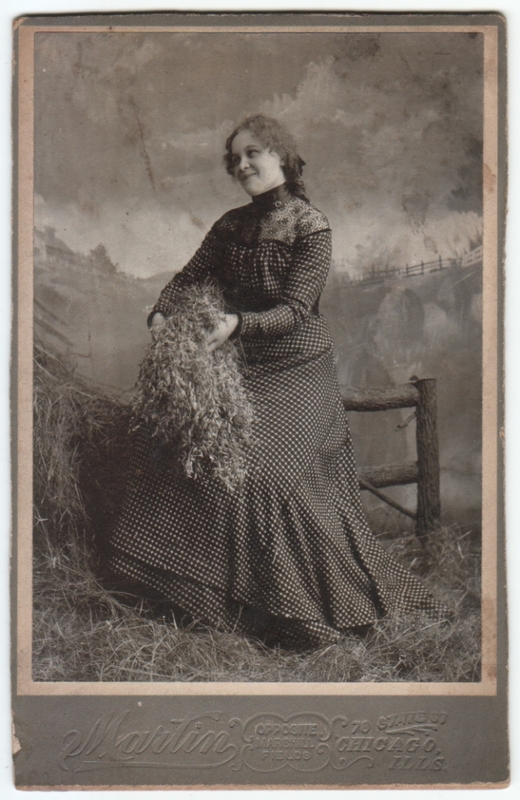 She looks real sturdy like she might actually do farm work. I think a picture of her from the front ,straight on, might reveal a woman who is perhaps attractive. It is absoltuely hair and is very clear, once enlarged. Why its hair, don’t know but it is a studio, although hair in downtown Chicago makes less sense than in a country setting. In her case……..hair today, gone tomorrow. I see what you mean now that you say it. I guess I was thrown off by the fact that she’s surrounded by hay/straw, so I figured she was handling something similar. Perhaps we are to believe she is gathering freshly shorn hair from a long-hair sheep to take in, card, and spin into wool. It’s funny to think of that being a standard prop in an urban photo studio, but it’s equally funny to think of her hauling it in specially for this shoot. Agreed. It almost looks like her hair. It’s the boudior shot of those days!